Obama lost key groups of white voters by the largest margins since the 1980s, but that doesn't mean Republicans can rely on whites to retake the White House. This much is undisputed: In 2012, President Obama lost white voters by a larger margin than any winning presidential candidate in U.S. history. In his reelection, Obama lost ground from 2008 with almost every conceivable segment of the white electorate. With several key groups of whites, he recorded the weakest national performance for any Democratic nominee since the Republican landslides of the 1980s. In 2012, Obama won a smaller share of white Catholics than any Democrat since Jimmy Carter in 1980; lost groups ranging from white seniors to white women to white married and blue-collar men by the widest margin of any Democrat since Ronald Reagan routed Walter Mondale in 1984; and even lost among Democratic-leaning college-educated women by the widest margin since Michael Dukakis in 1988, according to the latest National Journal analysis of the trends that shape the allegiances of American voters. And yet, behind rousing support from minorities everywhere, and often much more competitive showings among whites in both Democratic-leaning and battleground states, Obama not only won reelection but won fairly comfortably. Few decisions may carry greater consequences for the Republican Party in 2016 than how it interprets these facts. The key question facing the GOP is whether Obama's 2012 performance represents a structural Democratic decline among whites that could deepen even further in the years ahead — or a floor from which the next Democratic nominee is likely to improve. In recent months, a chorus of conservative analysts has bet on the first option. They insist that Republicans, by improving both turnout and already-gaping margins among whites, can recapture the White House in 2016 without reformulating their agenda to attract more minority voters — most prominently by passing immigration-reform legislation that includes a pathway to citizenship for those here illegally. On the other side is an array of Republican strategists who view minority outreach and immigration reform as critical to restoring the party's competitiveness — and consider it suicidal for the GOP to bet its future on the prospect that it can squeeze even larger advantages out of the diminishing pool of white voters. Karl Rove, the chief strategist for George W. Bush's two presidential victories, has noted that relying entirely on whites would soon require Republicans to regularly match the towering advantage Reagan recorded among them when he lost only a single state in his 1984 reelection. "It's unreasonable to expect Republicans to routinely pull numbers that last occurred in a 49-state sweep," Rove said at the Aspen Ideas Festival this summer. The results of previous elections can't forecast how voters will divide next time. But they do show clear trends in both the electorate's composition and the preferences that will shape the competition between the parties in 2016 and beyond. To better understand these dynamics, National Journal has updated a project we conducted in 2008 and 2012 that analyzed, in unusual detail, the fault lines among American voters. In those initial reports, titled "The Hidden History of the American Electorate," we examined the results from the general-election exit polls conducted by news organizations in every presidential campaign from 1980 through 2008. In this latest report, we expand the analysis to include the results of the national and state 2012 National Election Pool exit poll conducted for a consortium of media organizations by Edison Research. The poll surveyed 26,565 voters at 350 polling places on Election Day, and another 4,408 absentee and early voters through a telephone survey. Because the exit poll includes so many more voters than a typical survey, this effort allows us to explore much more finely grained shifts among voters than are usually available — the evolving preferences, for instance, not only of Hispanics overall but of those with and without college degrees, or the (substantial) differences between college-educated white women who are single and those who are married. The result is a uniquely panoramic look at the fluctuating boundaries of change and the insistent currents of stability over the past nine presidential elections. And that prism offers a unique perspective on the choices facing the two parties as they begin contemplating their strategies for 2016. Initially most Republican leaders viewed Obama's reelection as a demographic wake-up call for their party. They did so with good reason. Despite the lackluster economy, Obama surprised many observers by winning 51 percent of the popular vote, garnering 332 Electoral College votes, and outpolling Mitt Romney by nearly 5 million ballots. The president's victory meant that Democrats had carried the popular vote in five of the previous six presidential elections, matching the Republican record from 1968 to 1988. Obama notched striking gains among both Hispanics and Asian-Americans, equaled the overall 80 percent of nonwhite voters that he carried in 2008, and amassed a solid 60 percent majority among voters under 30 (who are themselves heavily diverse). Although many Republican analysts predicted Obama could not replicate the enthusiasm he generated in 2008, minorities and young people both increased their share of the overall vote, as whites fell to 72 percent of the electorate, the lowest level ever. All of this allowed Obama to win his unexpectedly comfortable victory, even though his performance among white voters deteriorated from 43 percent in 2008 to just 39 percent in 2012. Romney, by winning 59 percent of whites, roughly equaled the best performances ever among them by a Republican challenger (essentially matching Dwight Eisenhower in 1952 and George H.W. Bush in 1988) and actually exceeded the 56 percent of whites that Reagan won in 1980 (although not the 64 percent peak the Gipper reached during his reelection tsunami). Numbers such as these prompted the "Growth and Opportunity" internal review commission, which Republican National Committee Chairman Reince Priebus appointed after the 2012 election, to conclude: "The nation's demographic changes add to the urgency of recognizing how precarious our position has become"¦. Unless the RNC gets serious about tackling this problem, we will lose future elections; the data demonstrates this." That same concern about regaining ground among minority voters, particularly Hispanics, encouraged the participation of four Republican senators (led by Florida's Marco Rubio) in the bipartisan Senate "Gang of Eight" that began negotiating immigration reform. But through 2013, the sense of demographic urgency inside the GOP has palpably dissipated. Instead, an array of conservative analysts has advanced a competing theory for Romney's defeat: He failed to generate a big enough margin among whites. Sean Trende, a writer for the conservative-leaning website RealClearPolitics, has promulgated the most comprehensive version of this argument. Using census figures, Trende insists that Romney failed to turn out about 5 million to 6.5 million white voters who should have voted, most of them "downscale, Northern, rural whites" demographically similar to voters who flocked to Ross Perot in 1992. Though Trende heavily cross-stitched his pieces with caveats and qualifications, at bottom he argued that Republicans were less likely to recapture the White House by gaining among minorities than by improving both turnout and vote-share among whites — which he suggested could reach as high as 70 percent. "It seems a bit touchy to assume that Republicans will max out at around 60 percent of the white vote," he wrote. "This might be the case, but "¦ it's entirely possible that as our nation becomes more diverse, our political coalitions will increasingly fracture along racial/ethnic lines rather than ideological ones"¦. I don't see any compelling reason why these trends can't continue, and why a Republican couldn't begin to approach Ronald Reagan's 30-point win with whites from 1984 in a more neutral environment than Reagan enjoyed." Trende's piece has inspired fierce and increasingly Talmudic exchanges with Democratic electoral analysts (who mostly have argued that he confused an overall decline in turnout rates from 2008 to 2012 with a particular Republican problem among whites). But his analysis has become a rallying cry for conservative activists who reject the view that the 2012 result proved that the party must adjust its message to appeal to more minority and young voters by, among other things, enacting immigration reform. Rich Lowry, editor of the National Review, and William Kristol, editor of The Weekly Standard, crystallized that argument in July when they penned an unusual joint editorial opposing the Senate immigration bill. "At the presidential level in 2016, it would be better if Republicans won more Hispanic voters than they have in the past — but it's most important that the party perform better among working-class and younger voters concerned about economic opportunity and upward mobility," they wrote. "Passing this unworkable, ramshackle bill is counterproductive or irrelevant to that task." Talk-show host Steve Deace, a leading Iowa conservative, observed that "the real reason" Romney lost was not his meager performance with minorities but that he "did so poorly turning out the GOP base." The ascent of this view inside the GOP helps explain why most House Republicans have so firmly resisted immigration reform — and why, after all of the Senate's bipartisan negotiation, just 14 of the 45 GOP senators ultimately backed the immigration legislation, nine fewer than supported a similar comprehensive plan under Bush in 2006. Can Republicans bet their future primarily on the notion that the party can amass even bigger advantages with whites? The answer depends on two distinct factors: turnout and vote-share. The past two elections have offered Republicans many encouraging signs about their standing with whites. In 2010, exit polls showed that Republicans carried 60 percent of white voters in congressional races — their best showing ever, in both exit polls since the 1970s and in the University of Michigan's American National Election Studies tracing back to 1948. In 2012, while winning a comparable 59 percent among whites, Romney displayed dominant strength with groups that usually tilt toward the GOP, particularly married, noncollege, and older whites. With some of these groups, the NJ analysis shows, Obama sank to depths Democrats haven't experienced since the Reagan and George H.W. Bush landslides. Obama, for instance, lost noncollege white men — once the brawny backbone of the New Deal-era Democratic coalition — by a crushing 31 percentage points, the widest deficit since 1984. He lost married white men and married white women by the largest margins for his party since 1984. He lost whites nearing retirement by the widest margin since 1988, and white seniors by the most since 1984. Among older working-class whites (those without college degrees age 45 or older), he faced even larger deficits than Mondale did against Reagan. Likewise, the analysis shows, Obama lost white Catholics, once considered perhaps the single most decisive swing group, by a larger margin (19 points) than Mondale did. Obama didn't sink to record deficits among two other GOP-leaning groups — college-educated white men and noncollege white women — but he lost each by around 20 percentage points. Even among the portions of the white community generally open to Democrats, Obama's performance flagged. After running essentially even among single white men in 2008, he lost them by 8 points in 2012 — the party's weakest showing since 2000. His margin among white single women (ordinarily one of the Democrats' best groups) fell from 19 percentage points in 2008 to just 6 in 2012, the party's smallest advantage since 1988. Likewise, after carrying college-educated white women his first time, Obama lost them in 2012 by 6 percentage points, the party's biggest deficit since 1988. His overall deficit among white women spiked to 14 percentage points, double the level in 2008 and the biggest shortfall the party has faced since Mondale. Among whites younger than 30, Obama fell from a 10-point advantage in 2008 to a 7-point loss in 2012. Among whites in households with a union member, the exit poll found, Obama edged Romney by just 2 percentage points. Some of these results look like hardening patterns. Romney's performance slightly stretched, but largely continued, trends in which recent Republican nominees have averaged huge advantages among married white men (almost 31 percentage points since 2000); married white women (more than 21 percentage points since 2004); noncollege white men (over 27 points since 2000); college white men (almost 20 points since 2000); and noncollege white women, the so-called waitress moms (19 points since 2004). As the Silent Generation that came of age under Harry Truman and Dwight Eisenhower succeeds the "GI Generation" forged under Franklin Roosevelt, the political orientation of white seniors has also clearly transformed: Although Bill Clinton carried white seniors in each of his two campaigns, a majority of them have voted Republican in all four elections since then, each time by a wider margin. Romney became the first GOP nominee since Reagan in 1984 to cross the 60 percent threshold with this group. Republicans look as well positioned with the older baby boomers near retirement. Yet these advantages, while commanding, can also provide Republicans an exaggerated sense of comfort. On both the turnout and margin fronts, a whites-first strategy would face entrenched, structural challenges. For Republicans to increase the white share of the electorate in 2016 or beyond would require them to reverse the virtually uninterrupted trajectory of the past three decades. According to the NJ exit poll analysis, the white share of the total vote has declined in every election since 1980, except in 1992, when it ticked up to 88 percent (from 85 percent in 1988) amid the interest in Perot's quirky third-party bid. Otherwise, this decline has persisted through years of both high and low overall turnout. Even in 2004, when George W. Bush's state-of-the-art microtargeting and turnout operation allowed Republicans to equal Democrats as a share of the total vote for the only time in the history of polling, whites' share dropped 4 percentage points from 2000. Throughout 2012, many Republicans anticipated that the white proportion of the vote would increase from 2008 and even quietly based their polling on that assumption; but, ultimately, the white share of the vote followed the long-term trend and fell to 72 percent — exactly the level that Obama campaign manager Jim Messina projected early in the year. In a mirrored development, the minority share of the vote rose to 28 percent, 2 percentage points above 2008 and more than double the 12 percent level for Bill Clinton's first victory in 1992. The challenge for Republicans hoping to reverse these voting trends is that they reflect tectonic shifts in the overall population. Although the change in the electorate has trailed the change in the total population, the two lines have moved in parallel. From 1996 to 2012, according to census figures, the white share of the eligible voting population (citizens who are older than 18) has dropped about 2 percentage points every four years, from 79.2 percent to 71.1 percent; over that same period, whites have declined as a share of actual voters from 83 percent to 74 percent (according to census figures) or even 72 percent (according to the exit polls). With minorities expected to make up a majority of America's 18 and younger population in this decade, all signs point toward a continued decline in the white share of the eligible voter population — which suggests the GOP would have to marshal heroic turnout efforts to avoid further decline in the white vote-share. If the electorate's composition follows the trend over the past two decades, minorities would likely constitute 30 percent of the vote in 2016. With one exception, Republican nominees since the 1970s have shown only modest appeal to that growing population. In both 2008 and 2012, Obama won a combined 80 percent of minority voters. In fact, as ABC pollster Gary Langer notes, the Democratic nominee has won between 78 percent and 82 percent of the two-party vote among nonwhites in every election since 1976, except in 2004, when Bush's strong minority appeal held John Kerry to just 71 percent. The "Hidden History" analysis shows very few cracks in the Democratic dominance among both African-American and Hispanic voters in 2012. Even among groups in the African-American community in which Republicans had displayed at least some presence from 1980 through 2004 — men, those with a college education, and those who are married — the GOP registered little more than trace support in each of the two contests against Obama. In each of his two races, Obama won an astounding 96 percent among African-American women, but the Democratic nominee has reached at least 90 percent among these voters in every election since 2000. Likewise, Romney faced broad repudiation from Hispanics. Obama won nearly two-thirds of Hispanic men and more than three-fourths of Hispanic women. Each of those numbers represented the Democrats' best performance since 1996. Obama slipped somewhat from 2008 among married Hispanics, but he still exceeded the Democrats' two showings against George W. Bush. The only signs of encouragement for Republicans: During the rout, Romney gained ground from 2008 with college-educated Hispanic men (falling just short of Bush's level with them in 2004) and also attracted just over 40 percent of Hispanic Protestants, many of them evangelical social conservatives. Still, Catholics remain the largest group among Hispanics, and among them Romney drew only 21 percent, less than any GOP nominee since 1980 (except for Bob Dole in the three-way race of 1996). All of these results map the depth of the minority-voter hole confronting Republicans — and the daunting math they will face if they can't recover at least somewhat. If minorities reach 30 percent of the vote next time, and the 2016 Democratic nominee again attracts support from roughly 80 percent of them, he or she would need to capture only 37 percent of whites to win a majority of the popular vote. In that scenario, to win a national majority, the GOP would need almost 63 percent of whites. Since 1976, the only Republican who has reached even 60 percent among whites was Reagan (with his 64 percent in 1984). Since Reagan's peak, the Democratic share of the white vote has varied only between 39 percent (Obama in 2012 and Clinton in the three-way election of 1992), and 43 percent (Obama in 2008 and Clinton in 1996). To shatter that band, and return to the margins among whites they enjoyed under Reagan, Republicans would need to overcome another set of demographic changes. Just as the overall composition of the country is changing, so is the nature of the white electorate. These changes are generally displacing white groups that vote overwhelmingly Republican with white groups in which Democrats run more competitively. That dynamic makes the recent GOP performance among whites even more impressive — but also shows the difficulty of climbing still further. The shifts are visible across several dimensions. Republicans now reliably run better among whites without a college education than those with at least a four-year degree. In 1984, those noncollege whites represented 62 percent of the total vote, while college-educated whites constituted just 27 percent. That meant working-class whites represented more than two-thirds of all white voters. But since then, according to the exit polls, the share of the vote cast by those working-class whites has declined in every election except 2000, hitting a low of 36 percent in 2012. Meanwhile, the share of college-educated whites grew through the 1990s and has fluctuated in a narrow range since. In 2012, the exit poll found, college-educated whites also cast 36 percent of the vote, marking the first time they have equaled working-class whites. Similarly, every Democratic nominee since 1980 has run better among white women than white men. While white men and women represented equal shares of the vote in 1984, in 2012 the women (at 38 percent) outvoted the men (at 34 percent). Combining education and gender underscores the point. Men without a college education have become the most reliably Republican component of the white electorate; women with a college degree are the most receptive to Democrats. In 1984, those blue-collar men cast nearly three times as many votes as the white-collar women; in 2012, for the first time, the college women (at 19 percent) outvoted the noncollege men (at 17 percent). Given that the share of white adults with at least a four-year degree has increased in every year since 1981 except two, and that women are garnering nearly three-fifths of those degrees, this gap is likely to widen. Marital status pushes in the same direction less dramatically. Every Democratic nominee since 1980 has run better among single than married whites. In 1984, married couples represented 70 percent of all white voters; by 2012, that number slipped to 65 percent. (The decline has been especially sharp among married white men, who have voted more Republican than married women in each election since 1984.) 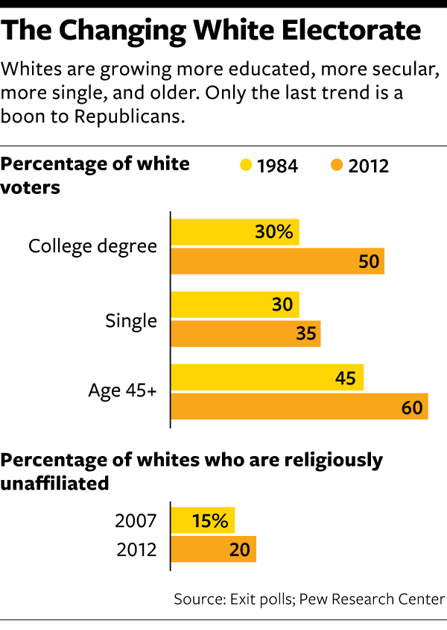 Another trend steepening the grade for the GOP is growing secularization. Since 2000, Democrats have averaged a 32-point advantage among whites who identify with no religious tradition, and the share of them has increased from 15 percent in 2007 to 20 percent by 2012, according to studies by the Pew Research Center. These shifts in the white electorate change each election almost imperceptibly, like the slow melting of an iceberg. But over time they add up. "Every structural change you are talking about is moving in the direction of whites improving their votes for Democrats," says Stanley B. Greenberg, the veteran Democratic pollster. "Big trends in the country — what's happening in education, marriage, in the religious sphere — all point to an upward trend among whites." Consider this hypothetical. If Romney had matched his 2012 performance among white men and women with and without a college degree, but those four groups still constituted the same share of the white electorate as they did in 1984, Romney's total vote among whites would have edged up to around 61 percent. That was just about the level he needed to win the popular vote. The major countervailing force is that the share of whites in union households has steadily declined, and that white population is aging even as Republicans have widened their advantages with older whites. On the other hand, with the Democratic-leaning GI Generation dwindling, the older white voters passing out of the electorate every four years are concentrated in the Silent Generation that has voted reliably Republican in recent years. Through 2020, the younger voters replacing them will be members of the Millennial Generation (generally regarded as those born between 1981 and 2002), which has shown much more openness to Democrats. Since 2000, when the first millennials became eligible, Democrats have averaged 45 percent among whites under age 30, far more than the 36 percent they averaged with young whites during the 1980s (and much more than what they are attracting from older whites now). This suggests that one critical variable is whether today's young white millennials will move toward the GOP as they age. Michael Dimock, director of the Pew Research Center, which has extensively studied generational voting patterns, says there is some precedent for such a shift: Older baby boomers who came of age from the Kennedy to Nixon presidencies have shifted toward the GOP in recent elections (the youngest boomers, who reached adulthood under Gerald Ford and Jimmy Carter, have voted more consistently Republican). And as young people struggled in the economy, Obama's showing among younger whites did drop sharply from 2008 to 2012. But, Dimock says, the evidence from other generations doesn't support the notion that voters "inherently [drift] Republican as they age." Moreover, he says, the liberal-leaning positions the millennial generation expresses on social issues remain a barrier to further Republican inroads with them. "Young people are not off-the-scale liberal when it comes to the social safety net or government programs, but there is a really strong pull from those social issues," he says. Dimock notes that the generation following the millennials, which is reaching awareness amid the political stalemate and economic struggles of the Obama years, may not replicate their older siblings' Democratic leanings — but they can't vote at all until after 2020 and won't participate in large numbers until after that. Geography poses another complication for a whites-first GOP strategy: Even if the Republican Party can further expand its overall national advantage among whites, its another thing to do so in the states critical to the Democratic presidential victories over the past two decades. Romney's national margins among the various groups of white voters are inflated by Obama's utter collapse in the country's most conservative regions, particularly the South (where the president won fewer than one in six whites in Alabama and only one in nine in Mississippi, exit polls found). In most of the places where Obama needed to do better among whites to win, he did. "Some of this you have to look at regionally, because this is exaggerated in the Appalachian parts of the country and the South," Greenberg says. "The white numbers in the industrial Midwest and on the East and West Coast are different." Indeed, analysis conducted for National Journal by Edison Research shows that Obama equaled or exceeded his national share of the vote among noncollege whites in 22 of the 31 states in which exit polls were conducted last year — and won each of them except Indiana. Likewise, he equaled or exceeded his national share of the vote among college-educated whites in 22 states, and won all of them except Montana. (See "The White Vote, by State," p. 17.) North Carolina was the only one of the nine battleground states that both sides actively contested in which Obama did not match or better his national showing among either noncollege whites (Ohio and Florida), whites with college degrees (Virginia), or both (New Hampshire, Wisconsin, Iowa, Colorado and Nevada). Obama carried each of those states beyond North Carolina. Weighing all these factors, most political professionals in both parties who have expressed an opinion are somewhere between dubious and scornful of the notion that Republicans can rely almost entirely on further gains with whites to recapture the presidency without meaningfully improving among minorities. "This is an anti-mathematical position," says longtime Democratic pollster Geoff Garin. "Electoral reality is not the product of somebody's ideological wishes. It's arithmetic. And the arithmetic is working badly against the Republicans." Similarly, Greenberg, who polled for Bill Clinton, says Obama faces unique problems among whites both because of his race and the gruelingly slow economic recovery. "Those things together make me think these white numbers [for Democrats] are not the new baseline — that they are much more likely to go up than down," he says. Veteran Republican pollster Whit Ayres is no less dismissive. "Any strategy that is predicated on [consistently] getting a higher percentage of the white vote than Ronald Reagan got in 1980 is a losing strategy," he says. "It's the same thing Democrats would talk about in the late 1980s after they had lost five of the previous six presidential elections in the popular vote. What they would say is, we need to get the nonvoters to vote; the nonvoters are with us. It never happened." The whites-first argument, Ayres adds, "is not getting much penetration among people who are serious about winning presidential elections. It is getting traction among people who are trying to justify voting against immigration reform or making any of the other changes that are necessary to be nationally competitive in the 21st century." Republican strategist Rich Beeson, the national field director for Romney's 2012 campaign, takes a more nuanced view. In theory, he says, the next GOP nominee might achieve enough white gains to win without improving among minorities. But as the minority population continues to increase, Beeson adds, "is it a recipe for long-term success? Absolutely not." All four consultants, like others in both parties, agree that Republicans would face additional challenges expanding or even maintaining their white margins in 2016 if Democrats nominate Hillary Rodham Clinton. Not only would her status as the first female major-party nominee give her an obvious calling card with white women, but during the 2008 nomination fight against Obama she also appealed effectively to some voters whom Obama has always struggled with. "Working-class whites connect with her and President Clinton in a way they don't with President Obama," says Garin, who served as the senior strategist in her 2008 campaign's final stages. That doesn't mean Hillary Clinton would be a favorite to win most white women (no Democrat has since Bill Clinton in 1996), and she has almost no chance of carrying most working-class whites. But absent big GOP gains with minorities, she could win, even comfortably, just by maintaining Obama's showing with whites; Republicans would face the burden of pushing her below Obama's performance. Though it's very early, the first 2016 polling instead has generally shown her trimming Obama's deficit among whites both nationally and in key states. Ayres says that rather than hoping to increase their showing with whites, Republicans must prepare for "the likelihood that the Democratic nominee, particularly one who doesn't come from the far left wing of the party, will get [a] higher proportion of the white vote" than Obama did in 2012. "That means," Ayres adds, "Republicans have simply got to rethink the formula of how you get to 50-plus-1 percent." Kristol, the GOP thinker, doesn't concede that Republicans are unlikely to expand their white margin against Clinton if she runs. "It's true that Republicans have not done much better [than in 2012], but if Romney-McCain becomes the high-water mark for the Republican Party with any group of voters, they are in trouble," he says. And while Kristol believes Republicans will alienate conservatives for little gain with Hispanics if they pass immigration reform, he says the party next time should intensify its pursuit of minority voters on other grounds. "I very much hope the Republican Party by 2016 will have a conservative reform agenda especially speaking to working- and middle-class Americans," he says. "I still think there's a problem [with Hispanics], but I don't think it's inevitable that you can never get above the 27 percent [Romney won with them] if immigration doesn't pass." In some ways, the very existence of this debate encapsulates the GOP's challenge. It's unlikely that a party with more diversity in its coalition would be debating whether it could respond to those voters without sacrificing its principles. But even in a rapidly diversifying nation, Republicans remain almost entirely dependent on the votes of whites, who supplied Romney with nearly 90 percent of his total support and cast over 90 percent of the ballots in almost all of the party's 2012 presidential primaries. Nearly four-fifths of House Republicans represent districts that are more white than the national average. This means that minorities who might be drawn to the party by a different mix of policies, such as comprehensive immigration reform, have minimal influence in shaping the party's agenda now. For those seeking a more inclusive and diverse GOP coalition, the first hurdle is that the future doesn't have a seat at the table today. CORRECTION: A chart in the original version of this story gave the incorrect share of white voters with a college degree in 1984 and in 2012. The correct shares are 30 percent and 50 percent, respectively.